Sesame Street introduced its first muppet with autism a year ago. See how Julia has been quietly changing the world. Sesame Street’s first muppet with autism, Julia, doesn't talk a lot. But a year after she moved to Sesame Street, her message of inclusion and understanding is coming through loud and clear. Julia started as a character in Sesame Street’s “See Amazing In All Children” initiative, aimed at fostering inclusion among children and their grownups. She made the jump from the digital Sesame universe into the real, honest-to-goodness Sesame Street to hang out with Elmo, Big Bird and all the rest because Sesame executives saw how much positive impact her character was having. “We hear from parents that their children (with autism) have more play dates from others watching Julia. We hear from teachers that their classrooms are more inclusive after watching segments with Julia,” said Sherrie Westin, executive vice president of global impact and philanthropy for Sesame Workshop, the nonprofit organization behind Sesame Street. After Julia’s introduction on the Sesame Street broadcast, a national survey found that half of adults in America had heard of Julia. A separate study, conducted by Georgetown University Medical Center and Children’s National Health System, looked at the “See Amazing” digital initiative and found that more than 50 percent of parents of children without autism reported feeling more accepting of children with autism after exploring the website. That’s significant because bullying of autistic children is a serious problem, and many parents of children on the spectrum say that isolation and judgment from the larger community is one of the hardest things for them to handle. With Julia as the public face, Sesame Workshop is continuing its digital efforts with the “See Amazing In All Children” website and campaign, which includes videos and books for kids as well as resources for parents and educators. Sesame launched its first-ever Kickstarter campaign to raise money (since it is a nonprofit) to create a new anti-bullying book about autism. With 21 days left in the campaign, they’ve raised $45,000 toward the goal of $75,000. TODAY Parents teamed up with Sesame Street to make a video exploring some common questions about autism. We turned to parents in our own community who have children with autism — Ronnie Koenig, Carrie Cariello and Eileen Shaklee — as well as Kerry Magro, who shares his experiences as an adult with autism on his blog. They shared questions for Julia, Alan and Elmo based on their own experiences with autism. Koenig has a 6-year-old daughter with autism who loves Sesame Street, and says she was thrilled when Julia’s character was introduced. “Julia is so much like my Evelyn,” Koenig said. 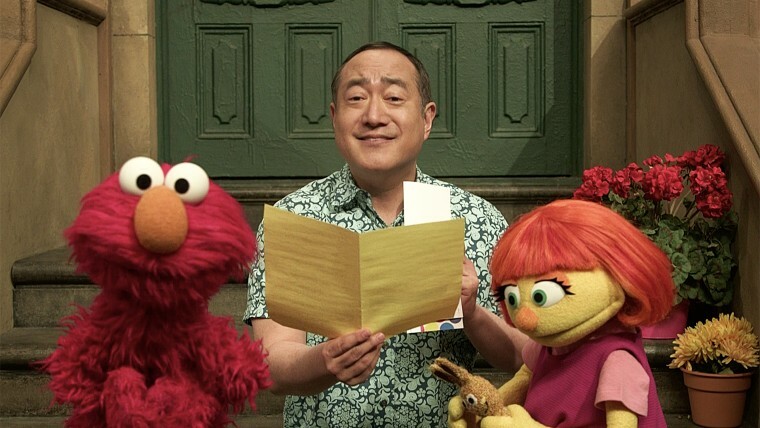 Alan’s character, played by Alan Muraoka, often helps the child-aged muppets on the show understand Julia’s autism — for instance, he explains to Big Bird that Julia wants to be friends with him even though she doesn’t make eye contact or always respond when he says hi. Elmo, as Sesame Street’s perpetual 3-and-a-half-year-old, has formed a special bond with Julia, and models for neurotypical children how they can include children on the autism spectrum in their play.